A short article - look at the before and after photos at the end of the article - impressive! Having scars stung by bees resulted in improvement of scar appearance by reducing, soften, and flatten scar tissue, and toning down the color of the scar. Of the 18 substances present in bee venom the enzyme hyaluronidase is mainly held accountable for these results. Also internal scar tissue is thought to benefit from this alternative therapy. This alternative scar treatment isn’t suitable for people who are allergic to bee stings so the first step should be an allergy test. More info and before and after photo’s of someone who has actually applied bee stings to a scar here: before and after." Just in time for the cold season - "A study by Pennsylvania State College of Medicine in the US found that honey outperformed over-the-counter cough medicine." MOTHER Nature has made honey so sweet and comforting, so thick and syrupy with such a soothing texture that we often don’t give its medical qualities a second thought. Yet its sweetness is one of its healing secrets. It contains the dynamic duo of glucose, which is an instant energiser, and fructose, which builds reserve energy. The bee delivers energy to us in a concentrate that is pre-digested, ready to act on our metabolism. According to research on athletes it provides energy within seven minutes. Hippocrates, the father of modern medicine, prescribed honey for cleaning wounds and healing ulcers in 400BC but it fell out of favour following the discovery of penicillin in 1928. In recent years the growth in superbugs such as MRSA has seen honey come to the rescue for everything from abscesses and fungal infections to post-surgery wounds. Many of its medicinal, antibacterial and healing properties still baffle scientists but as a general immune-booster and a remedy for coughs, colds and sore throats it is well known. A study by Pennsylvania State College of Medicine in the US found that honey outperformed over-the-counter cough medicine. Not only does honey stop cross-infection, it also prevents contamination moving on to other wounds. Research by the University of Sydney in Australia in 2007 concluded that honey dressings should be used as a first choice, although the type of honey used is important as some have up to 100 times more antibacterial properties than others. At the Children’s Hospital in Bonn, Germany, MRSA infection of a wound in one child was treated for 12 days with an antiseptic which saw no improvement. Australian antibacterial honey cleared it after two days. Borage honey contains the herb borage, which works in a similar way to statin drugs prescribed to lower blood pressure. Borage widens the arteries and the engorged blood supplies deliver feelings of wellbeing and energy. Take two teaspoonfuls whenever the mood takes you but remember, a teaspoon of honey contains 22 calories, whereas the same amount of sugar contains 15. This painful condition is caused by a bacterium attacking the stomach wall. Honey sticks to the lining of the stomach preventing further damage. Two teaspoons of honey up to three times a day stops ulcer damage according to research published by the US National Library of Medicine in Maryland. Liquid honey has a mild laxative effect, especially appropriate for constipation associated with ageing and bloating caused by a diet rich in processed food. Honey has minute traces of acetylcholine which helps transmit nerve impulses throughout the body. Measure your pulse, then take two to three teaspoons of honey 30 minutes before bed for two to three weeks. Take your pulse again and you should notice the difference. Your pulse should be lower and more stable. Bees decorate the insides of their hives with a protective “wallpaper” called propolis. It is an effective healer, germ-buster and rapid rescue treatment and is available in cream, liquid essence, spray and capsule form. Propolis cream can be applied to skin to treat psoriasis, eczema, acne and allergy rashes. Mouth and gum infections can be alleviated by taking 30 drops of propolis essence, three or four times a day. Dilute in warm water and gargle for sore throats and laryngitis. One drop a day during autumn and winter can act as a preventative measure against colds and flu. Propolis also has an anti-inflammatory effect and three or four capsules a day can reduce joint pain. If bees put their heads down millions of flowers, why don’t they get hay fever? The answer is because they are surrounded by nature’s own antihistamine, bee pollen. Once bee pollen is inside your bloodstream, your body starts developing immunity to it. Adults should take four to six pollen capsules a day from March to September or two to three teaspoons of pollen-laden honey per day. This type of honey looks cloudy around the rim and may marble the whole jar. This white, creamy substance, responsible for giving the queen bee an elegant, long body and long life, has a list of nutrients but scientists can’t work out its complete formula. Royal jelly may help the brain stay young. It contains a compound called acetylcholine, which is used to send messages through the nerve network. Levels of this transmitter decrease as we get older causing memory loss and a lack of concentration. It is also a good source of vitamin B5, which is held in high esteem for both its de-stressing and its anti-ageing effects. This expensive wax is high in beta-carotene, a bioflavonoid that is converted by the body into vitamin A, good for skin conditions such as acne. Beeswax also contains antibacterial, anti-fungal and antioxidant properties, which is why it is applied to wounds and sores as a barrier against further injury. It is used in medical lubricants applied during clinical examinations and for protective coverings. Slow-release coatings on pills are often made of beeswax. They stop drugs from being digested in the stomach so they reach the intestinal tract where they can be more effective. 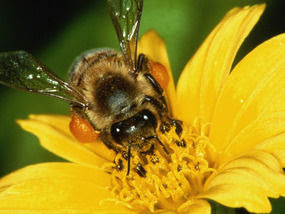 Apitherapy News: Are Bee Products the New Alternative Medicine?